The Mending Project at ICA brings people together over stitches and art | Arts and Culture | Style Weekly - Richmond, VA local news, arts, and events. The hum of 6-year-olds' curious questions and the echoes of quiet stories fill the expansive third level of the Institute for Contemporary Art. Here, Lisa Hutchinson sits behind a long wooden table. The self-proclaimed sustainable seamstress has a needle in one hand and grips a pair of small pink cotton leggings in another. Across the table sits Ava, 6, with her mother Courtney Bassett and little brother Elliot. Ava brought in her well-worn leggings to be sewn so she can hand them down to her little sister, who is 4. Lisa begins to stitch the hole in the right knee with a bright blue thread. "The exposed repair is an extension of the conversation," says Samantha Best, curatorial production manager of the ICA. "It's a memento as opposed to it being an invisible, perfect mend. It will lead to more conversations outside of the museum." As Hutchinson sews, she chats with Bassett, who is one of nearly 10 people she talked with during an hour of her volunteer time on a Wednesday afternoon. She's one of the first volunteers who answered a call ahead of the institute opening in April. She's sat the mender's chair five times and helps train new volunteers. "Sometimes you feel like you might have met someone in another life," Hutchinson says. "It happens a lot here. It's like having dinner with someone. You are instantly connected." The walls of the True Farr Luck Gallery are dotted with colorful spools of thread. Best says the museum bought nearly 1,500 to stage the exhibit. Artist Lee Mingwei's assistant Sandy Wong arranged the spools on the walls. The table was created in Richmond by Eric Stepp of Stepp One. Small piles of clothing rest on half of the table. Volunteer menders like Hutchinson have repaired each article. Mendees like Ava can opt to leave their mended items to become a part of the growing exhibit. As they are added to several neatly stacked piles on the table, a thread from the wall of colorful spools is tied to each item. At this point, they become a visible representation of minor connections made between people over this table and also with other visitors who pass through the installation. The only permanent records of the interactive exhibit are two notebooks. Inside, menders write names and notes to keep track of who left items and how to get in touch with each person. Here, menders can also record meaningful stories and interactions. The exhibit shares a room with three more installations. Five photos hang in a row across from the wall of spools. Here, Nidaa Badwan shares self-portraits taken from a 100-square-foot room in which she confined herself for 20 months. At the top of the stairs that lead into the exhibit, a yellow glow leads visitors to the "The La-A Consortium, Waiting Room" mixed media installation by Nontsikelelo Mutiti and Autumn Knight. A performance is set for Sept. 8. Two white squares in the middle of the gallery look like stools for sitting. In face, they are sculptured stacks of large white paper, each stack featuring a different phrase. Visitors can take home a piece of paper from the 30-year-old installation exhibit by Felix Gonzalez-Torres. 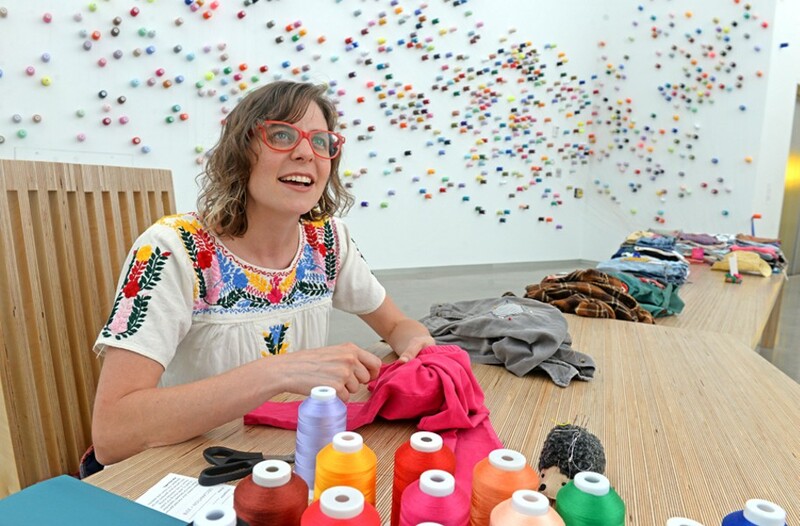 The Mending Project runs until Sept. 9 at the Institute for Contemporary Art in the True Farr Luck Gallery. Menders are present Tuesdays through Sundays, 10 a.m. to 1 p.m. and 2 to 5 p.m. with additional hours 6 to 8 p.m. on Wednesdays. Visitors may take repaired garments with them on the day of their visit, or may leave the item to be added to the exhibition. Participants may retrieve items when the exhibit closes. Correction: A performance date for Autumn Knight has been changed to Sept. 8 and Lee Migwei's assistant Sandy Wong arranged the spools, not Migwei.